Much of the discussion in Davos this week will focus on technology and jobs. But what will the Fourth Industrial Revolution mean for our children and the way we educate them? How do the jobs they aspire to and the skills and knowledge they are acquiring relate to the jobs we think we will need? They are of course the workforce of our future and key to the success of this revolution. 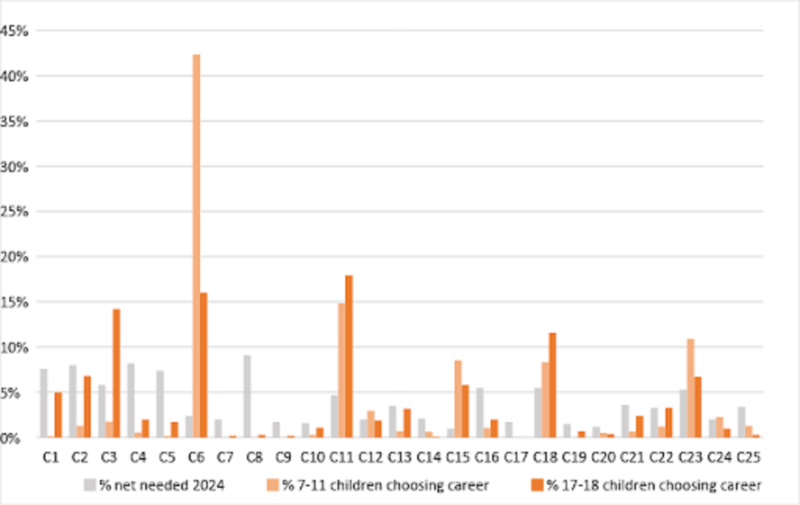 New analysis by the charity Education and Employers examines the career aspirations of young people in the UK aged 7-11 and 17-18 and maps these against projected labour market demand (C1 to C26 representing different economic sectors). As the OECD’s Programme for International Student Assessment (PISA) has shown, certain “technical” and higher-earning professions that often require university degrees, such as medicine law and veterinary science are disproportionately popular among students from higher socio-economic backgrounds. Such career aspirations are influenced by a number of people – parents, friends, teachers, employers, career guidance counsellors – in addition to what young people are exposed to in the media. Parents and friends influence student choices in complex ways, but the impact of socio-economic status on career aspirations can be seen very clearly in PISA. Whatever the socio-economic bracket, the narrow spectrum of aspirations is particularly worrying since previous research has shown that there is statistically “nothing in common” between teenagers’ career ambitions and projected labour market demand. The issue is one of over-concentrated aspirations. Aspirations that often do not match up with their knowledge and expectation of the level of education needed. Young people make important decisions relevant to their working lives through their teenage years about the subjects they choose to study at 14, and whether they stay in education and what and where they study at 16 or 18. They also make important decisions about whether they will seek out work experience relevant to occupational interests. Commonly, young people are unable to understand the breadth of ultimate job opportunities across the economy, leading them to potentially identify unrealistic career aspirations. Those from affluent, well-connected backgrounds find it far easier to get work experience, which enables them to have a much better understanding of the different available careers and make better informed choices. One-third of PISA respondents expressed interest in just 10 different occupations; other studies have come to the same conclusions. Previous research has also suggested that teenagers who underestimate the qualifications needed for their desired profession are more likely to be unemployed in their early 20s, with less affluent young people being significantly more likely to have career aspirations that are misaligned with their educational choices. We now know that this mismatch is set at a young age and heavily influenced by socio-economic background, gender and the role models seen by children. As our research has shown, children’s aspirations appear to be shaped by gender-specific ideas about certain jobs. Boys overwhelmingly aspire to take on roles in traditionally male-dominated sectors and professions. Gendered patterns also emerge in STEM-related professions. Over four times the number of boys wanted to become engineers (civil, mechanical, electrical) compared to girls. Moreover, nearly double the number of boys wanted to become scientists compared to girls in our sample. However, strikingly, two and half times the number of girls wanted to become doctors compared to boys, and nearly four times the number of girls want to become vets compared to boys. As leaders gather in Davos to discuss the Fourth Industrial Revolution, Capitalism 4.0 and how to build a collaborative future at a time of unprecedented technological disruption, children from the primary school in Davos have for the first time been asked what jobs they aspire to and the reasons why. The vast majority want to be sport stars, teachers or take on a technical/manual profession – largely because they see people doing those jobs. These results reinforce the findings of the Education and Employers’ Drawing the Future report, launched at last year’s World Economic Forum, which showed that gender stereotyping about jobs starts at a young age and is a global phenomenon. Today, on 22 January, as the World Economic Forum opens, children from the Davos primary school will meet an amazing range of people and have the opportunity to ask them questions about their jobs and career routes. This kind of interaction between volunteers from the world of work, and young people, helps increase motivation, raises awareness about different jobs and the skills needed, and challenges stereotypes. Perhaps not surprisingly for a school located next to a ski resort, the vast majority of the Davos schoolchildren said they want to be sports stars. Meeting some of the participants from the World Economic Forum will certainly open their eyes to an amazing world of possibilities.